If you’ve followed my blog for any length of time, it will probably come as no surprise that I LOVE a fully stocked freezer when it comes to planning for dinner time (and breakfast too!) And even though I do like to do freezer meal prep cooking sessions using some of my favorite freezer friendly recipes like these found in my Recipe Index. 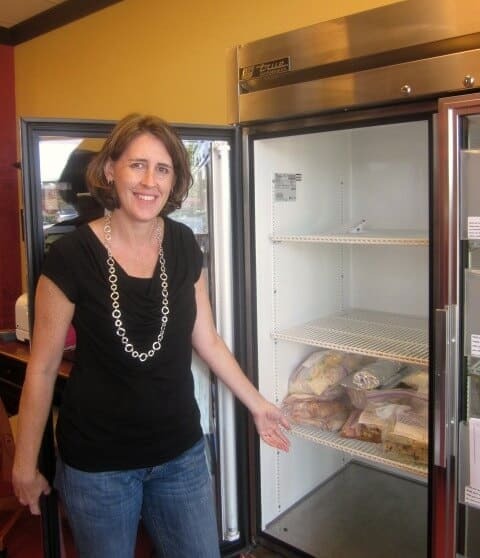 And I used to participate in a freezer meal exchange group which was also a great way for filling my freezer. But when that group dissolved and my schedule filled up, I found my freezer empty a little more often. So when I discovered Dream Dinners I was sold. I just went again yesterday and filled my freezer up! A friend and I have been going monthly since the beginning of last summer. Sometimes my daughter will join us for a session and she absolutely LOVES it. Not only is she spending time with me, she likes being a part of the dinner process by helping to assemble the kits. It has been SO nice to have real food meals ready to go for busy nights or on evenings when I don’t feel like cooking. I have found them to be especially handy on Sunday evenings when we’ve been busy with activities or just hanging out together. 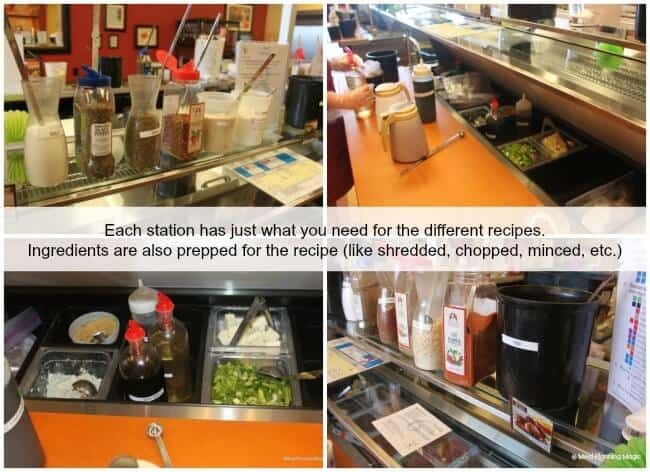 The concept is simple: come to their kitchens, where stations are set up stocked with all the ingredients you need to make a variety of meals. You choose your menu ahead of time so they’ll have enough of what you need. It’s like fast food for your freezer but oh so much better for you! They offer meals in three- or six-serving portions and you need to purchase a minimum of 36 servings per session but you can mix and match. For example, I might prepare a six serving portion of the fajitas because I know these would be great as leftovers for lunches or can usually stretch it enough with sides to serve it when company is visiting. For our family of four, I almost always get the three serving portions though. The protein weighs about a pound which is what I normally serve our family anyway. My son, who is in elementary school, doesn’t have as big an appetite as the rest of us. One time I got the hamburgers and made the patties into quarter pound portions and added my own extra bun (because I had only gotten three with the order). That’s a totally reasonable serving size I’d say and when we add sides, it makes a meal. Many times, we even have leftovers for one person’s lunch just from those three-serving portions believe it or not! I’ll be honest, at first I thought Dream Dinners meals were a little pricey, averaging $13-$20 per 3 serving meal. But considering our family of four can’t get out of Chick-Fil-A for much less than $25, Dream Dinners is a lot more budget friendly, PLUS a lot better for us nutritionally and calorie-wise. Sure, I can make meals for my family that might cost less but the ease and time saving aspect is a benefit also. And when you consider you don’t need to buy a large quantity of an ingredient just to have a little bit for a recipe that can save you money in the long run. This is especially true when it comes to spices. I normally get 8-10 meals per month so that leaves me plenty of days to cook on my own for my family whereby I can choose even more budget-friendly meals to fill in those extra days. 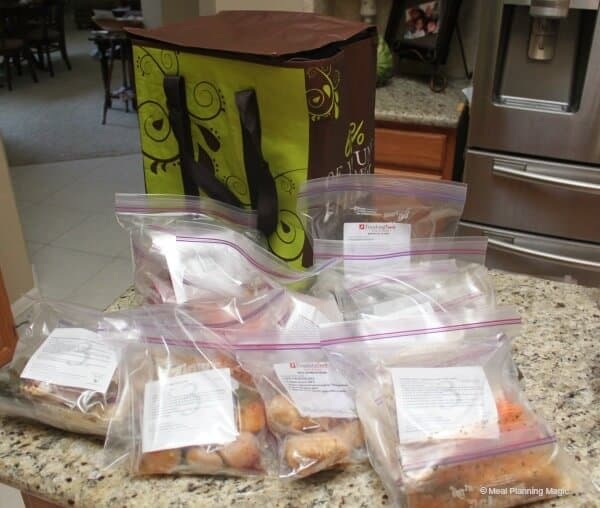 Thinking outside the freezer, I have a friend who brings her meals in a cooler on road trips with them when they are vacationing in a place that will have a kitchen. What a great way to enjoy “out-to-eat” type meals but on a much smaller budget than some touristy locations might provide! Like I mentioned before, if you don’t have the storage space to have a ton of spices or other bulk ingredients, Dream Dinners is a great solution because all the ingredients are available for you to assemble your meals and you use just what you need. Plus, since ingredients are purchased in bulk, the savings is passed on to you. I have a larger separate freezer to store my meals in by my friend only has the one attached to the refrigerator and she finds she still has room for other freezer items in addition to all her meals each month. With the wide variety of meal options available, it’s often hard to choose which ones my family will like the most. There are some that are true kid favorites like the Baked Potato Chicken and others that they may not think they would like but generally do, like the Creamy Chicken Risotto. When I have the main dish figured out, I can add a side that I know everyone likes and mealtime prep is done quickly. These meals also encourage my kids to try new things more often. Like I’ve mentioned, it also helps us gather around the table nearly every night for a home cooked meal. There are so many benefits to eating together as a family—you can read more about that and tips to take it a step (or steps) further by clicking here. On busy days or even those when I don’t feel like cooking, I LOVE being able to pull out a Dream Dinners meal the day before (or even that morning of) to just thaw and prepare as instructed. I’ve done most of the work upfront when I assembled them at the store. We have a pretty busy after school/evening activity schedule many days and add the kids’ homework to that, I love knowing that having a Dream Dinners meal in the freezer is going to simplify our routine. I just need to thaw, sometimes do a little bit of prep and then heat and eat! Make our life easier! We have especially been enjoying our freezer meals on Sunday evenings when we’ve been enjoying activities and time together during the weekend and can sit down to a home cooked meal with minimal prep before the busy work and school week! 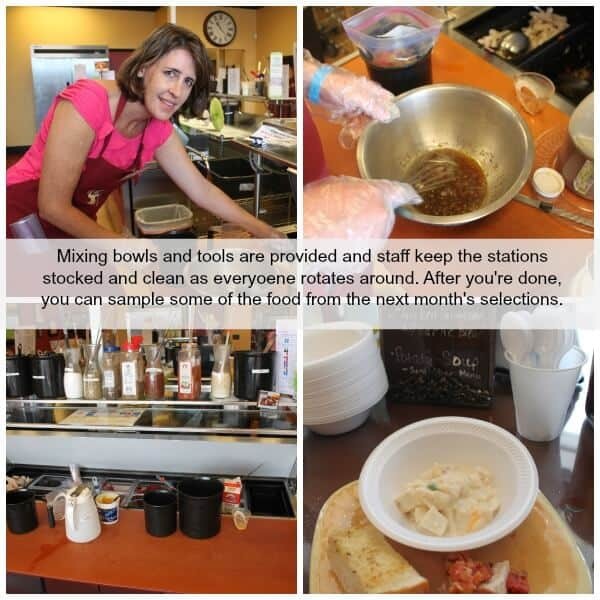 When you go in for a session, there are usually a couple of dishes that you can try there to taste. Every meal has nutritional data available online at the Dream Dinners website so if you’re watching calories, fat, carbs, fiber, etc. you can check online when making your selections. Most servings fit very reasonably into many common dietary guidelines. I’d have to say, most of the meals we’ve tried have been hits with only a few misses. Many of them are flavor combinations I would not necessarily have thought of like the Parmesan Pesto Salmon With Cheese Crisps or Seafood Cioppino or Cola and Lime Tender Pork Roast. 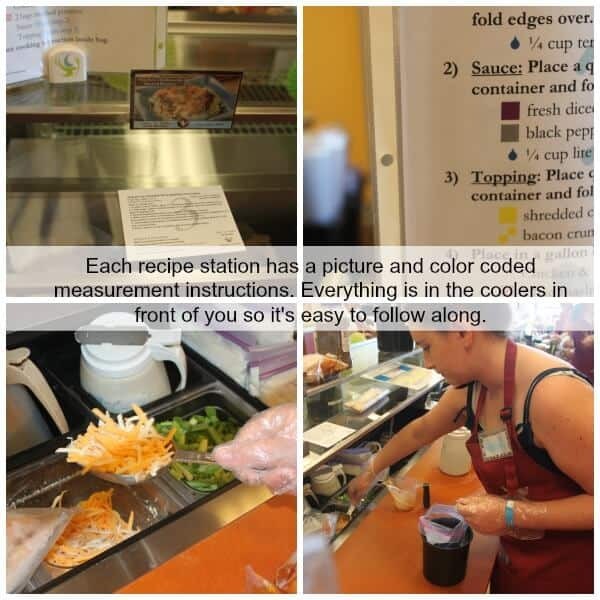 You can rate the meals you try each month and earn points through their Plate Points program. This not only helps you remember what your family thought of a meal (because a couple of times a year, Dream Dinners brings back fan favorites), the points you earn add up to money to spend on future Dream Dinner purchases. When I first started going about six months ago, I invited a few friends to join me. It was during the summer so my daughter joined me at first and she LOVED it! She loved following the recipes and the whole organization of creating a meal to take home and cook. You can also set up a private session, bring in drinks and enjoy a morning, afternoon or evening out with your friends while cooking together and doing something good for your family at the same time! Since then this summer, a good friend of mine and I set a session date each month to meet up and make meals together. It’s a fun way to spend time together! You can join a public session (which is what we do) or set up a private session for a larger group of friends each month. Another great thing about the Dream Dinners meals is that it forces us to try new things with minimal effort. We like trying different flavor combinations and because you get to choose your menu before your session you can customize to your family’s tastes. Don’t like shrimp? That’s ok, just choose something else instead. I like that my main meal is taken care of and all I need to do is add a side like a vegetable, salad or something else (I often make a rice pilaf). If you’re not sure what to pair with your meal, each instruction card also includes a suggestion for a side! 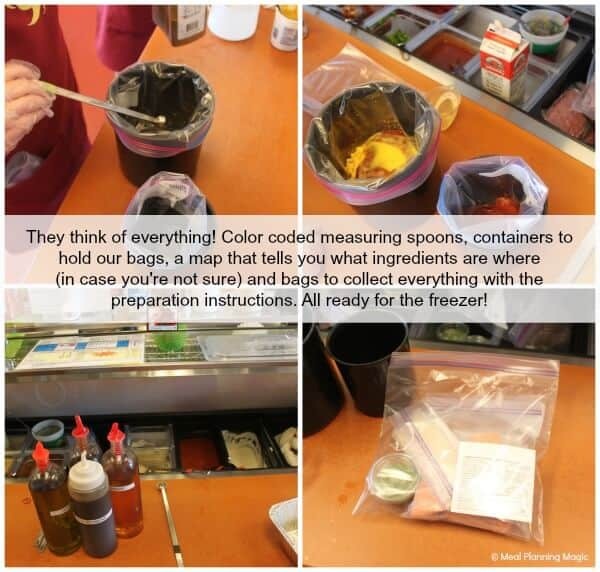 (You can also buy some sides from their freezer-ready case while you are at your session). In the freezer here are all my meals for the month–well at least 8-10 of them anyway! Here are all my meals from one month ready to go into my freezer at home. 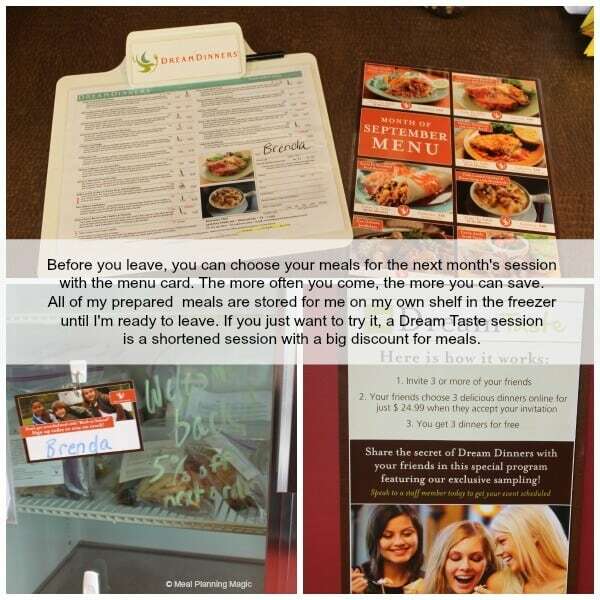 Dream Dinners is a franchise and they have nearly 100 locations across the U.S. You can visit their website to find the location nearest you. There are other businesses with a similar concept so if you don’t have a Dream Dinners near you, you can search for meal prep kitchens near you by clicking here. What tips and tricks do you have to keep meal time simple and budget-friendly at your house? Disclaimer: I have not received any compensation for this post. I just love their service and wanted to share! You should look up Wildtree, very similar idea…but much cheaper! I am in the Houston area! Email for more info. Thanks Jodi! I’ve actually used Wildtree before (a friend of mine sells it) and while I like it is not really the same because they are really more meal starters rather than all of the ingredients included as they are with Dream Dinners. Wildtree can still be helpful on busy nights though! What are some of your favorite meals from Dream Dinners. I just found a location near me and I would like to try it. Thank you! Hi Kathy! How great that you have a Dream Dinners location near you! We have so many favorites from Dream Dinners….here are a few: Pub Style Chicken with Mashed Potatoes, pretty much any of the turkey burgers or mini meatloaves (they have different recipes nearly every month and we’ve not had one yet that we didn’t like-including the kids! ), and beef burgers too (like most of them). We also like the Carne Asada tacos, chicken soft tacos with key lime corn, outlaw chicken sliders (my kids especially LOVE this one! ), fully loaded baked potato and chicken soup, any of the tortellini casserole dishes (we’ve liked them all). I like pretty much all the Thai or Asian inspired shrimp dishes but my family is not as much in love with them–so sometimes I will just get the 3 serving of those and make that and another 3-serving Dream Dinners meal for all of us. The pork chop meals have been more hit or miss for us. Hope this helps–enjoy!